About a week ago, I found about a dozen queen cells in hive one, which I had already split just a week before that. This hive swarmed last spring, too, and I had to requeen it. None of the cells were capped yet and I thought, erroneously, that I could prevent a swarm by removing the cells. I was fortunate that the hive had not yet swarmed because the queen laid new eggs and the nurse bees began raising a new batch of queens. Queen cells protruding from the frame. I still hoped to at least do a swarm split by moving the old queen along with some brood to a new hive set-up, but I was away from the house during the day for 4 days straight (hey, I have a life aside from the bees) and they apparently swarmed during that time because there is very little uncapped larva, no eggs, but most important, no queen. So, I split the queen cells between the old hive and a new hive and both hives will have virgin queens. I expect to have to replace them if those queen raise the same type of aggressive bees my last virgin queen did. A very full frame of capped brood. Dividing the hive with queen cells and capped brood in both halves. 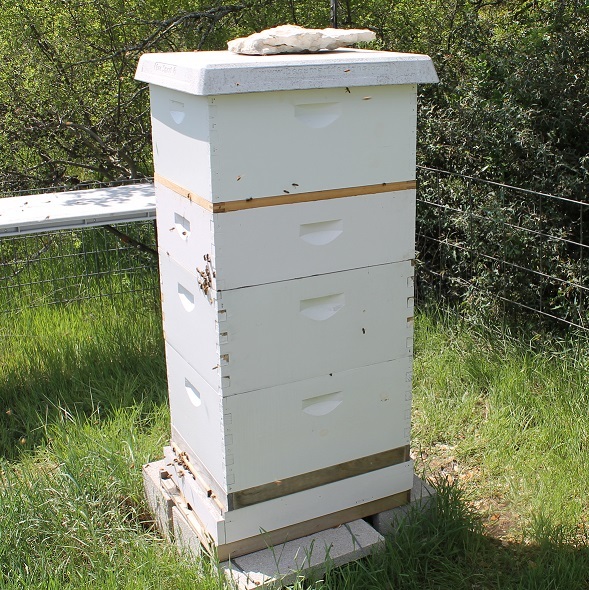 Next year, as soon as I see queen cells, I’ll move the old queen to a nuc (a mini-hive) so I don’t loose another valuable queen. We certainly need more bees out there, but loosing queens in a swarm feels like throwing money out to the wind. 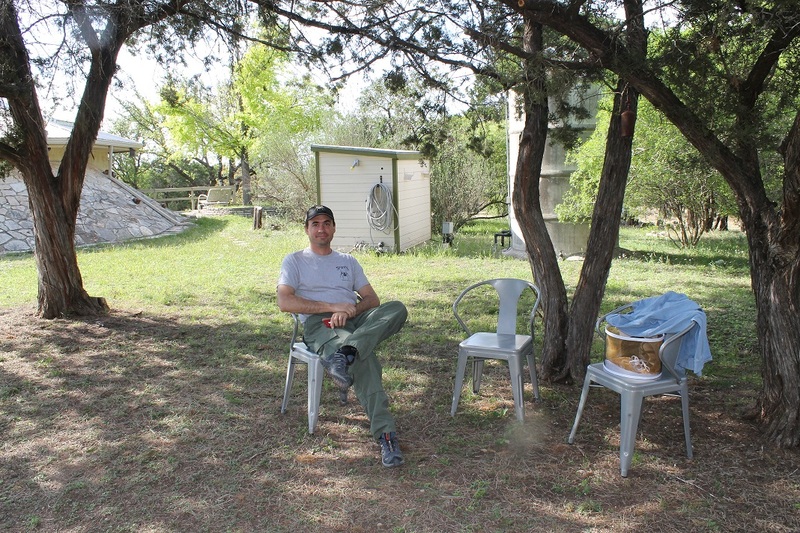 This spring, I went from two hives to five and I’m feeling a little overwhelmed by the sudden increase. After an inspection of hive two, I was pleased to see eggs and larva in both early and late stages. I also saw a few new bees coming out of their cells. 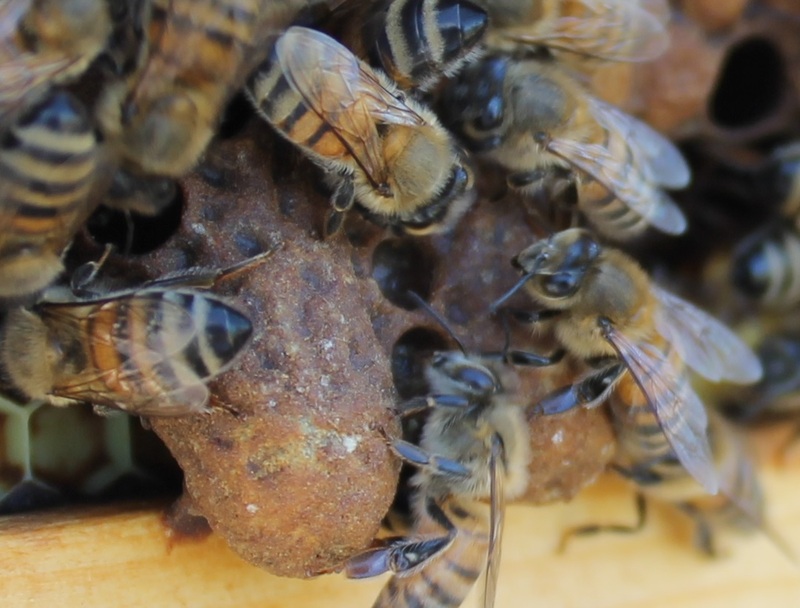 According to the calendar, the eggs of those hatching bees were laid by the old queen around the 8th of April. She was removed a few days after that, so the last of her brood should be hatching this week and then within a few weeks I should see a change in the demeanor of the hive as the new queen’s brood hatches. The time has finally come: it’s time to set up my new hives. I’ve been looking forward to and worrying about this for months. I’ve only split a hive once, and it went pretty well. I did more research and have discovered there are many ways to split a hive. Last year, I split my strong hive and immediately set up the split next to it. Then, my strong hive swarmed and I caught the swarm and combined it with the split. I began by preparing the split of hive one. I have several frames of brood in both honey supers, so the first thing I did was combine them into one super. Then, I took several frames of brood and larva from the brood chamber and put them with a frame of pollen in a new deep hive body box. I put the super with all the brood over the brood chamber, covered it with the queen excluder, then put the new box of brood at the top. By tomorrow morning, nurse bees will have climbed back up into the box to tend the brood and larva. While I was splitting the frames, I discovered a couple of queen cells, which I removed. There’s lots of contradictory advice on whether or not to leave queen cells. But I have a good queen in that hive and I’d like to discourage her from leaving. I’m hoping the split and the resulting extra space will keep them happy at home. While doing hive splitting research, I came across an article about using essential oils like lemongrass and spearmint in beekeeping. 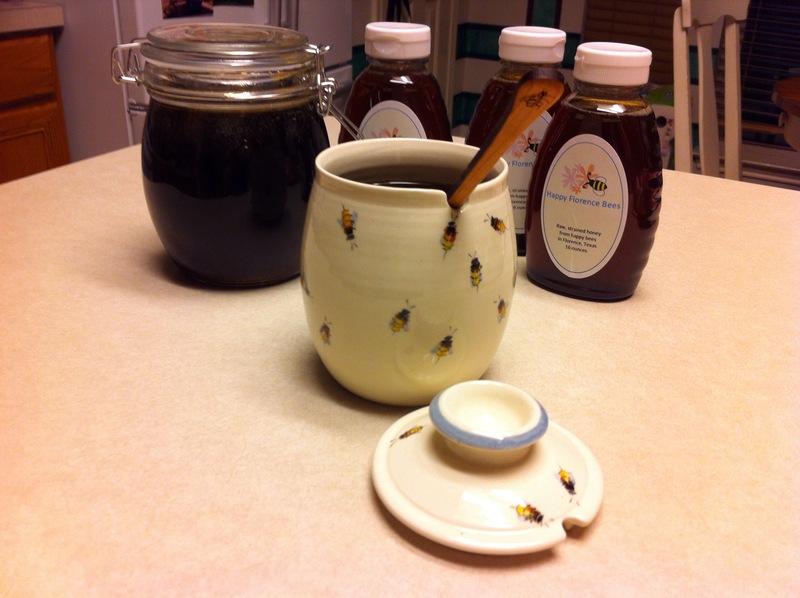 Many beekeepers report having great success with their hives when they add essential oils to the sugar syrup used when a hive is established. It’s also supposed to help keep them calmer when added to sugar water spray. I don’t have any food-grade oils on hand, but I do have some aromatherapy oil, so I added a few drops to a spray bottle of water and spritzed my suit and gloves to see how the bees would react. Hive one is generally pretty calm anyway, so the real test will come when I work in grumpy hive two. 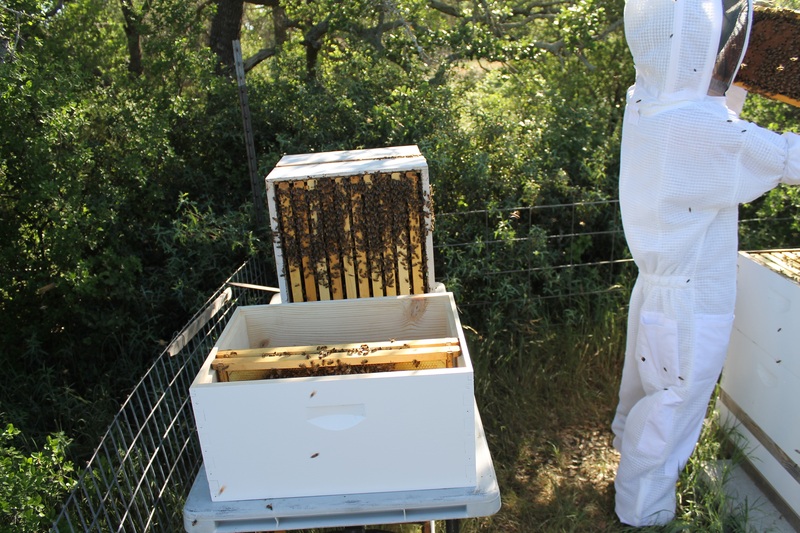 However, while the bees in hive one were not happy about all the frame moving and shaking (I shook the bees from the frames to get them all back into the bottom part of the hive), they were not stinging my gloves or suit as much as they tend to do. This afternoon, I will go find and remove the queen in hive two. I have no great expectations that a little lavender and lemongrass will keep those girls calm, but maybe they won’t go kamikaze on me and sting my suit and gloves in such great numbers. I was right: the lavender and lemongrass did nothing to calm hive two. 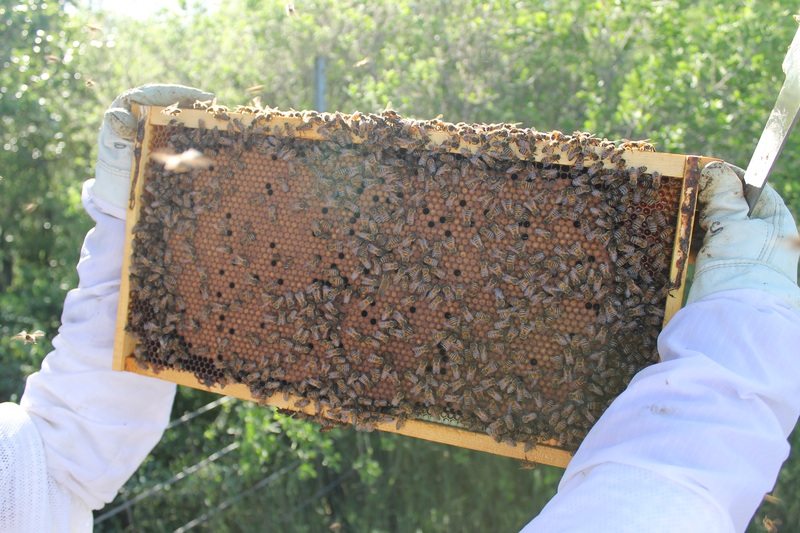 I began by checking for the queen in the upper brood chamber, pulling one frame at a time. No queen. So, I pulled that box off and set it aside (it’s really heavy, by the way). I checked all the frames in the lower hive body. No queen. Hmmmm. Next, I got an empty deep box and returned to the brood chamber, moving the frames I checked to the empty box. Still no queen. I did this with the lower box. By now, those bees are really unhappy. Several work hard enough to get a stinger through my leather glove. And I had to stop and relight my smoker. While these bees are pretty grumpy and aggressive, they are not Africanized. They don’t bother me when I’m in the area, and even today, when I went to get some supplies, only a few followed me, and then they returned to the hive. Africanized bees would be aggressive all the time and would continue to follow me in greater numbers when I leave the area. Back to the search. I checked all the frames in the hive body and moved them to an empty deep. Still no queen! I know she’s in there because I have tiny larva, fat larva, and capped brood. She’s been busy and she’s in there somewhere. I have a slatted rack at the bottom of the hive to relieve congestion, and several hundred bees were in there, so I pulled it off and sifted through them. After two hours, I finally gave up and put the hive back together. At least I was able to pull two big frames of honey after all that work. 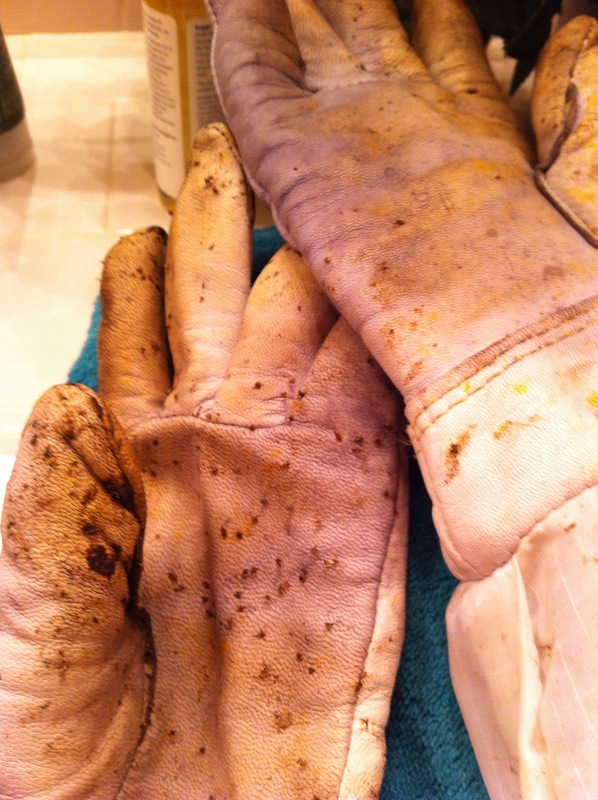 I couldn’t feel my left fingertip because several stings had penetrated my glove (time for new gloves? Yes, please), so I applied an herbal poultice mixed with a dab of honey. Does the trick every time. I woke up around 4AM, pondering my queen problem. I have to find her before I can introduce a new queen or they’ll try to kill each other and I’m sure I’ll get stuck with the old queen if that happens. 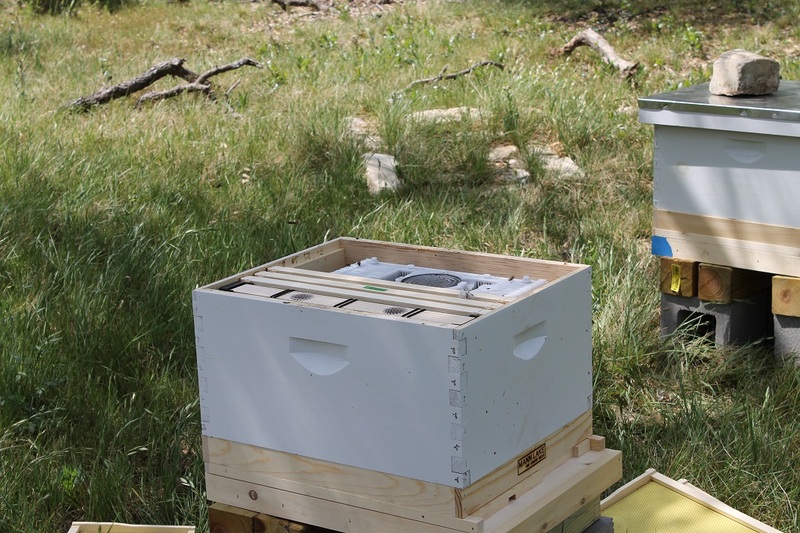 One reliable website suggests splitting the boxes 20 feet from the hive and searching for her away from the old location. That might work. But in the early hours of the morning, I formulated my own plan. Yesterday, to prepare the split of the happy hive (I love those girls), I shook all the bees from the frames to make sure the old queen wouldn’t be in my split – a new queen will go in that. I’m going to use a similar approach in the grumpy hive. It will take a couple of phases, because I’ll have to allow time for nurse bees to crawl through the queen excluder before I can move on to the lower box. Any bees left will be shaken off in the field. Some will be able to fly back, but the queen will not. By this evening, I’ll have two deep boxes that will not have a queen and I can introduce the new queen tomorrow. When the sun was up, I moved my split from hive one to its new home in the front pasture. 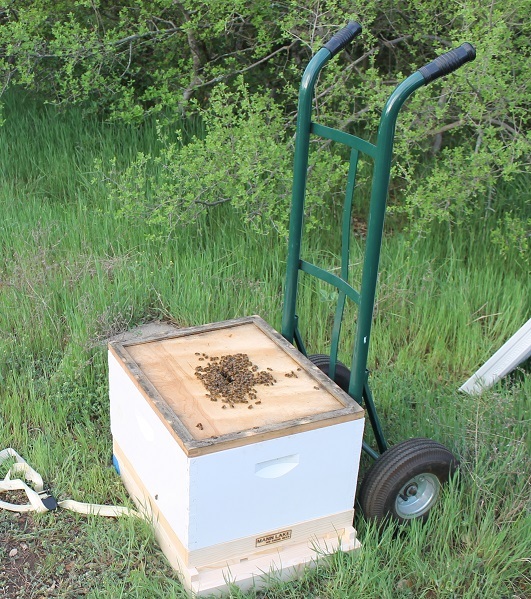 That was a long way to move a hive with a dolly. But we made it and they were fine. If only hive two had gone as smoothly. Preparing to move the split. The bees in hive two were still riled from yesterday and I didn’t calm them any by shaking bees from the frames. It would have been ok if they hadn’t found a tiny space between the zipper pulls on my suit. Before I knew what was happening, I had a handful of bees INSIDE my suit, stinging my face, neck, and head. I stopped everything and took off running (but not flapping my arms). I ran past the house, through the side pasture, and when I reached the back gate realized I really needed to get out of that suit. I started stripping it off, left it in the field with my hat and gloves and ran back to the house. I still had a few bees tangled in my hair, and somehow remembered that they drown easily, so I ran a hose over my head. Sure wish I’d thought of that FIRST. After treating my stings, putting on more layers, including two shirts, rubber gloves to go under my leather bee gloves, and a skull cap to go under my hat, I donned my veil and retrieved my suit from the pasture. On my next attempt, I taped all the zippers closed. 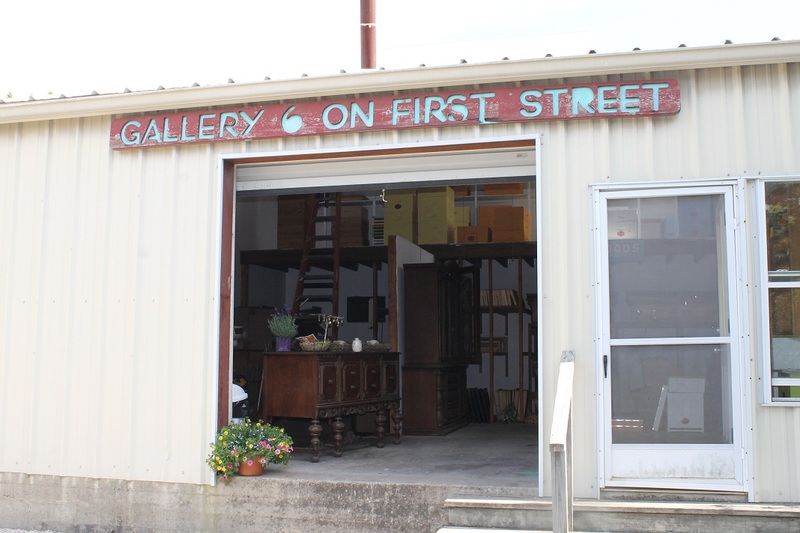 I moved my work table about 30 feet from the hive and smoked the hive like crazy to drive the bees down into the hive. As quickly as possible, I pulled off the top box and put the inner lid with the hole blocked back on the hive. I took the top box to the table to do the frame transfer. One frame at a time, I shook off all the bees and put the empty frames in a new box. I made sure to check my zippers often, just to be sure. Then I took the box with bee-less frames back the hive and quickly removed the inner cover, put on a queen excluder, and put the box on top. Nurse bees will climb up, but the queen will be confined to the bottom. I’ll repeat this with the lower box this afternoon. I made a quick trip to the ER because I got very nauseous and felt pin-prickly several hours after being stung. 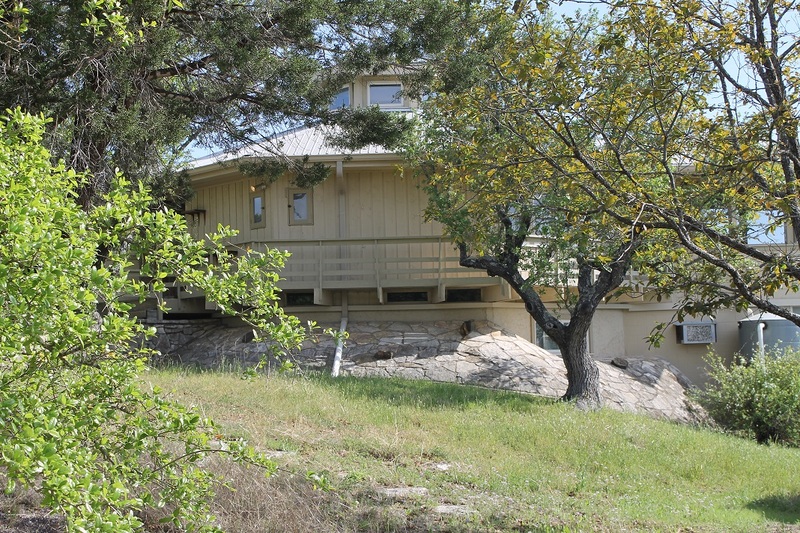 From there, my husband drove us to Dripping Springs to pick up a scheduled package bees and two new queens. 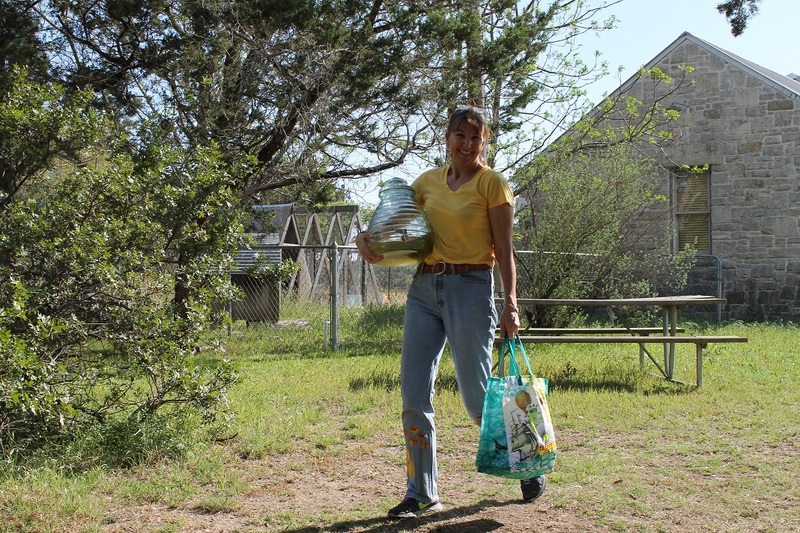 We visited with Ramona, sipped mint lemonade while we waited for our bees to be ready. We had just enough light left to put one queen in the split and tackle phase two of the hive two queen coup. Putting the queen in the split was a breeze: open the hive, tack the queen cage in, close it up. I was grateful I didn’t have to work alone for phase two. After having a mild systemic allergic reaction, having an extra pair of hands was important. We pulled off the top box I had emptied earlier. It had bees, as expected, but the queen excluder kept her down below. 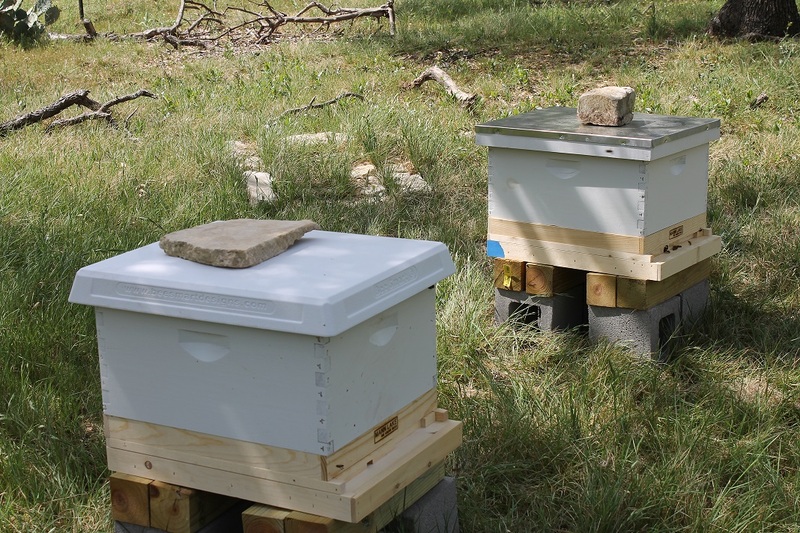 We set the top aside and quickly moved the bottom box, slatted rack, and bottom board to the table and shook all the bees out before transferring the frames to an empty box. Then it was ready to reassemble. The goal was to eliminate the queen. I never saw her, but she’s unmarked and there were thousands of bees around us, so I didn’t really look for her, just made sure she wasn’t on any of the frames I returned to the hive. I’ve promised not to do any work on any hives tomorrow until Hial gets home, and I’m happy to comply. Tomorrow, we will put the other queen in, but leave the cork in so they can’t release her before they accept her. I’ll smear a little honey from their hive on her cage to speed their acceptance, then remove the cork mid-week next week. All those little dots are stingers. Glad they were in my glove and not in my skin! Today was rough. I’ve had some confounding challenges over the past two years, but nothing as dangerous and difficult as this requeening. I will be very diligent about keeping good queens in my hives to limit this type of disaster again. I will also have to keep an epi-pen on hand now that I’ve had a systemic reaction. I’m at a higher risk for a more severe reaction when I get stung again. I spent Saturday morning harvesting honey from a few frames. In the afternoon, I installed the package of bees. I did some more research about using essential oils in sugar water to promote a strong healthy hive, so I used a recipe I found by Cass Cohenour at WV Beekeeper using spearmint and lemongrass essential oils. Installing my package of bees into a new hive. I also mixed up a spray bottle of the essential oil sugar water to use when I installed the queen in hive two. It really seemed to calm them and hopefully it will help them accept her. I only needed to smoke them a little when I opened the hive, then I sprayed the tops of the frames with the mixture and put an empty super on the hive. I stapled the queen cage to the frames, gave the bees another spray, then closed to hive and walked away. There’s a cork in the cage, which I left in for a bit so they couldn’t release her too quickly. During the day, I smeared a bit of honey from their hive on her cage so she would already have some of their scent on her. Sunday afternoon, I went back to the hive to see how the queen was faring. The bees appear to have accepted her and are crawling all over her cage, but not so thickly as to smother her (called balling). She is alive and well, so I removed the cork and put the cage back in the hive. I won’t open that hive again for several more days, when I check to make sure she was released. I was buzzed pretty heavily, but not like Thursday or Friday, and as far as I can tell, no bees actually stung my suit or gloves. That is a major improvement. This was a difficult experience, but I’ve learned a lot about how to deal with a hot hive and requeening. I also learned that having your pants tucked into your boots is a good way to get stung on the ankle. I did not have any allergic reaction, though, so I hope that ordeal is over. I’ll still carry my epipen in my beekeeper suit, just in case. I now have four hives, all with Bee Weaver queens.